When you see the best-dressed man in New Orleans, you’ll know it’s him by the way he is dressed. He combines New Orleans style with his a style all his own. The best-dressed man in New Orleans has no imitators. Instead, he has admirers. Mothers tell their sons to pay attention to what the best-dressed man in New Orleans is wearing. He is a man of many, many coordinating outfits that go together in surprising combinations. The best-dressed man in New Orleans doesn’t dress for success. Success has always seemed to find him, one way or another, nevertheless, without him having to seek it out. The best-dressed man in New Orleans is easy to pick out in a crowd. He is easy to pick out in traffic, too. THE BEST-DRESSED MAN IN NEW ORLEANS DRIVES A MOTOR SCOOTER. When people ask the best-dressed man in New Orleans what it’s like to be the best-dressed man in New Orleans, he shrugs. He has nothing else to which to compare it. The best-dressed man in New Orleans makes looking good look easy. He is nonchalant. He is comfortable in his skin. He is easy with a smile and he is forthcoming with a compliment. The most attractive thing a person can wear is confidence. The most useful accoutrement a gentleman can carry is kindness. The best-dressed man in New Orleans wears his hat at a jaunty angle. The best-dressed man in New Orleans tucks in his pocket square rumpled, loosely, Fred Astaire-style. 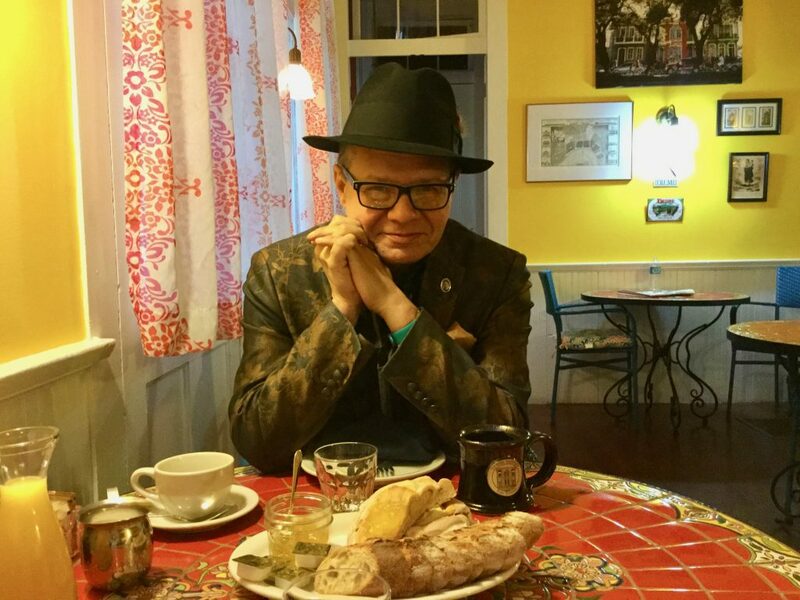 THE BEST-DRESSED MAN IN NEW ORLEANS WEARS A TOP HAT. The best-dressed man in New Orleans wears two top hats. He wears a black felt top hat in winter. He wears a white straw top hat in summer. He alternates between these two top hats for formal occasions, depending on the weather, during spring and autumn. Unlike wearing white after Labor Day, there are no hard and fast seasonal rules for top hats—especially in New Orleans. Wear ’em if you’ve got ’em. The rest of the time, he wears fedoras of various colors. This man will tell you everything you need to know about New Orleans. The best-dressed man in New Orleans is not afraid of color. The best-dressed man in New Orleans is not afraid of mixing patterns. The best-dressed man in New Orleans gets dressed in the dark, as many of his outfits can testify. The best-dressed man in New Orleans dresses like all the world is a stage and that we all have our role to play in making this world a better place. The best-dressed man in New Orleans dresses like he is ready to meet his maker at any moment. He certainly hopes he is. The best-dressed man in New Orleans doesn’t carry an umbrella. He remembers a conversation he had with Cindy when he bumped into her at the hardware store. Cindy told him to let a smile be his umbrella. It was good advice. To the best-dressed man in New Orleans, the sun is always shining, even when it’s raining. New Orleans glows with an inner light. Let a smile be your umbrella in New Orleans. WHERE DOES THE BEST-DRESSED MAN IN NEW ORLEANS SHOP? If every man in New Orleans dressed like the best-dressed man in New Orleans, New Orleans would be an even more colorful city. New Orleans is a city overflowing with style and grace, with its own fashion sense that has evolved to adapt to the city’s uniquely sub-tropical climate and its equally uniquely eccentric culture. There are several respectable haberdashers in New Orleans. The best-dressed man in New Orleans patronizes Rubenstein’s on Canal Street. The best-dressed man in New Orleans buys his hats at Meyer the Hatter, the oldest and largest hat store in the South. The best-dressed man in New Orlean is a man of many hats. When the best-dressed man in New Olreans has company, he invites his guests to stay at La Belle Esplanade. The best-dressed man in New Orleans always says, “Visit New Orleans like a New Orleanian.” Stay at La Belle Esplanade when you come to New Orleans. You’ll get a chance to meet the best-dressed man in New Orleans. The best-dressed man in New Orleans is all over this wonderful city. He’s everywhere. …ranked the #1 inn in New Orleans and in Louisiana, the #3 inn in the U.S., the #17 place to stay in the whole world. Sunday, April 15, 2018: It rained yesterday. It’s beautiful and sunny without a cloud in the sky, today. Every day in New Orleans is a beautiful day. Catch a wish.